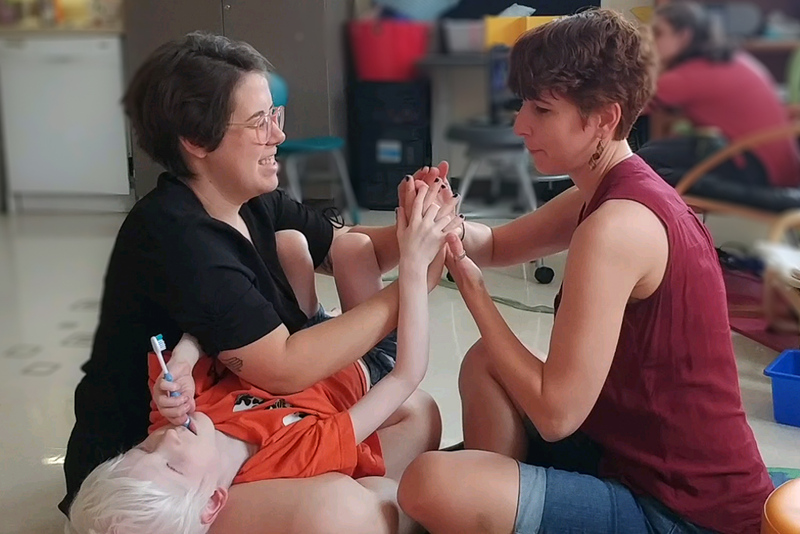 With his right hand, Orion feels the hands of Roxanne, his teacher aide, and Elizabeth, his teacher, having a tactile conversation at school. Orion is eavesdropping at school. Yes. This is mom-approved! 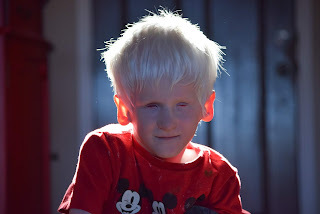 A DeafBlind child tactually nosing in on conversations! He’s been checking out tactile conversations through him touching the hands two adults in his classroom. A three-person unit! Two adults signing to each other and Orion is touching them with his hands. Using his feet are always an option for Orion. 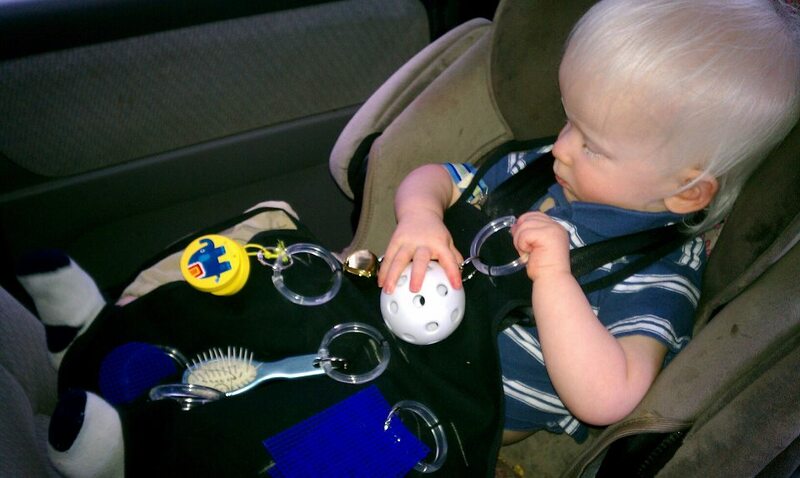 I know other DeafBlind children can relate to him this way--- being handy and footy. 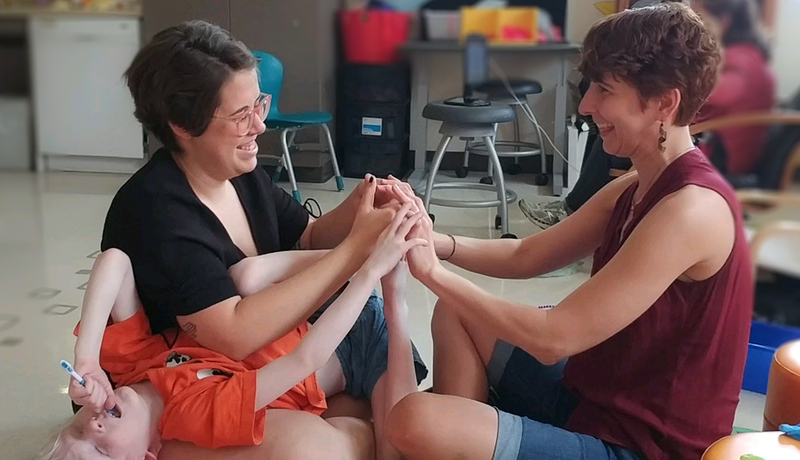 With his right hand already there, Orion brought his feet in to feel a tactile conversation between two happily amused educators. Observing conversations are a natural way of learning language and about the world; that doesn’t happen naturally for children who are DeafBlind. It dawned on me, perhaps during one of my past musing moments, that Orion didn’t have the benefit of just observing conversations happening between two other people, whether they were mundane or captivating. Growing up (Orion is now 8 1/2), when Orion experienced conversations, hand-under-hand observations, and hand play, it usually was between himself and another person. He had not extensively explored a tactile conversation between two other people. Orion has felt my arms or hands signing in the air, but not the hands of the person I was signing to. Children who hear can listen in on conversations, Deaf and hard of hearing children can see a conversation flowing through hands, facial expressions, body language. While conversation tones can be heard and seen, it can be felt as well. Symbolic words on the hands and body may still be abstract or elusive to him (I’m assuming… it’s a work of love in progress); I am thrilled he gets to observe the characteristics of a conversation between two others. He can feel the tone and responses of conversation participants. The best part is that he gets a kick out of it! Moving onto an area I believe is an important part of this--- the home and school connection. I truly appreciate Orion’s team at school. They can sign visually with us parents and tactually with Orion and other students who benefit from it. They’re interested in tactile information, tactile feedback, ProTactile. 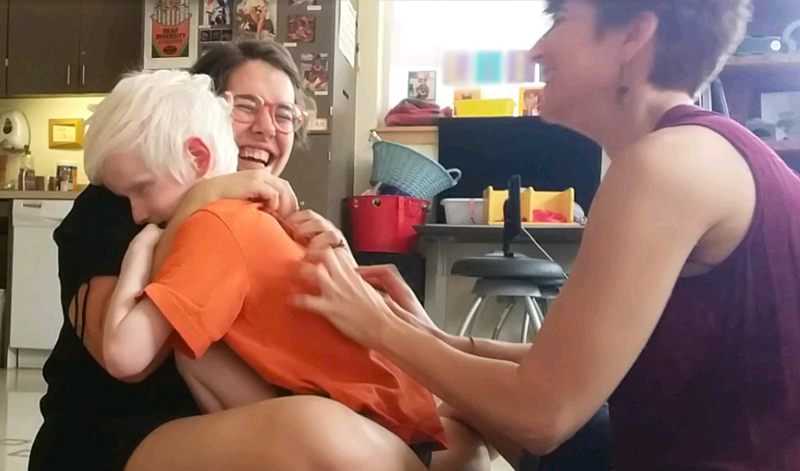 When a school team picks up different ways to communicate, they’re ready to use them with any unique DeafBlind child who comes to them. Orion’s teacher is constantly reflecting on what’s happening in the classroom, accessibility and on the conversation topics between home and school. As a Deaf person, I know what it is like to suddenly realize I’d been unaware of a spoken (or signed) conversation happening nearby. That perspective helped me consider the DeafBlind version of the same thing--- missing a tactile conversation nearby simply because the Deafblind person was not made aware of it. Orion’s teacher was listening to us parents, and of course, she reflected and now Orion has opportunities to "eavesdrop". I love it. The delightful photos shared in this blog post were the roses that we just had to stop and smell during this bustling "rat race" season for our family. We want to create the time and space to do the same thing at home as well. As a parent, I can say that having open lines of communication between home and school nurtures learning opportunities, whatever they may be, within the classroom and at home. Orion experienced the laughter of others, Roxanne and Elizabeth, through ProTactile--- one way is feeling the laughter at the throat and the other is "tickle fingers". This post was started sometime in 2016 and left alone as a draft. The recent experiences with Orion immediately enjoying some new toys this month reminded me of this older post I started. Here I am, finishing it and hoping it offers ideas and insight to other people with a DeafBlind loved one in their lives. Orion moves the beads on an abacus (by Melissa & Doug). Looking for a toy or gift for a DeafBlind child? It doesn't have to be a toy to be a total hit with the kid. Let's call 'em playthings! 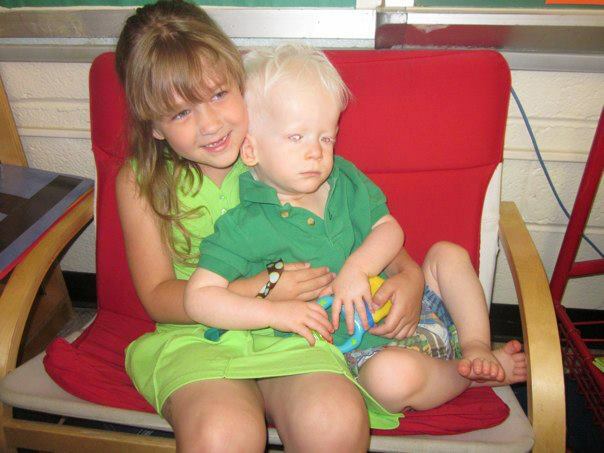 Disclaimer #1: When you've met one DeafBlind child; you've just met ONE DeafBlind child. 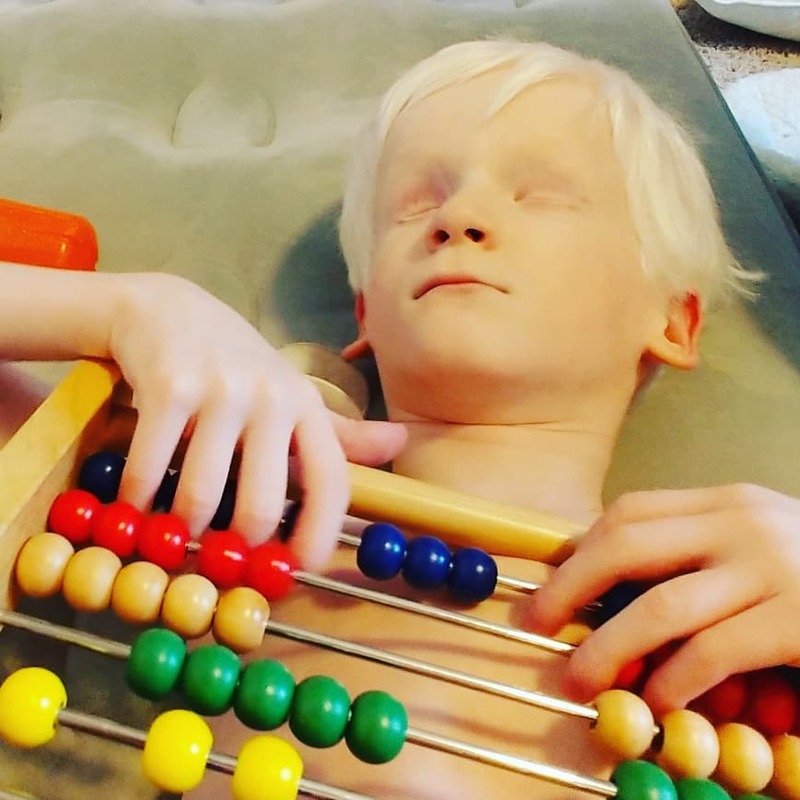 On top of unique personal preferences, every child has different etiologies of deafblindness, may have additional disabilities, health issues, communication, school and family backgrounds that may influence their level of interaction and progress with people and toys. Orion currently does not have usable hearing and as a Deaf parent, I give more weight to tactile, vibro-tactile and functional features when considering items for Orion. Orion's white hair is highlighted in the sunshine, November 2018. He was born on July 19, 2010. He does not use vision nor hearing but uses his senses of touch, taste, smell and proprioception to learn. To get around, he scoots/drags himself while laying on his back, rolls over or walks with assistance from an adult or sibling. He's an emerging communicator who mainly takes peoples' hands to where he wants attention- food, toys, seatbelt and assistance in getting up and around. Forever #1 on top of the list: Orion's and any other DeafBlind child's favorite playthings are their family members! Orion (almost 2) and big sister, A (6), sit together in her classroom. It was Kindergarten Graduation Day at Glenn Dale E.S. (MD). Photo by Heather Withrow, June 2012. 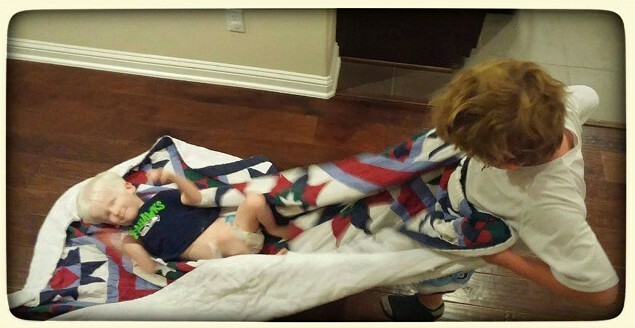 Orion's big brother, S, pulls him around the house on a blanket. Orion is around 3 to 4 years old in this photo. him to continue to enjoy interacting with others, particularly taking turns and mutually exploring objects and activities. He has initiated requests by taking our hands and putting our hands on what he wants help with. Reciprocal play is an unique connection between two people, especially without the use of words. This fun interaction may as well be the "soft skills" required for communication. Orion's dad, Thomas, and I participated in a series of interaction trainings with TSBVI DeafBlind outreach staff (Chris Montgomery & Deanna Peterson) during the 2017-2018 school year. The priceless insight we gained from these trainings not only benefitted us but also Orion's interveners when we shared discoveries, tips and cues to watch for with Orion. We realized that any adult may initiate turn-taking interactions with Orion, he will determine if your topic is of interest to him and respond back. That may be the "easy stuff", however, if Orion playfully invites you to interact with him, that's the golden stuff right there... and please respond to him! Tactually inform Orion of your presence (initially contact a knee or his lower arm near elbow, if interested, Orion will bring his hand to find yours). This lets him know you're there. He may be amused you're connecting with him at his level (a.k.a. his "topic"). You might answer your own question of "Why does he like doing that movement?" 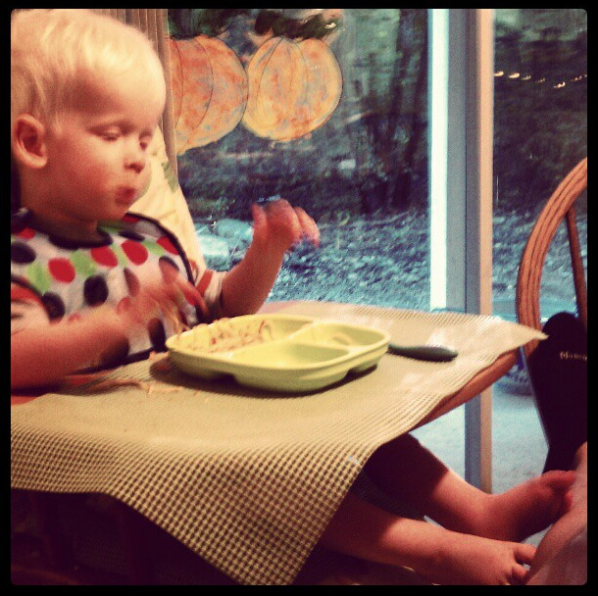 Orion (2) eats dinner in a high chair with tray. His feet are touching the leg of an adult which assures him she is still present even though there isn't any active interaction. Photo by Heather Withrow, October 2012. Take notes on particular deliberate hand/arm movements in case he initiates those moments out of context (when he's away from the toy or playroom). Accept Orion's invitations to play with him. Affirm/respond to Orion's deliberate movements, sign-babbling, and approximate signs. It would be a good idea to have a duplicate object of whatever he is playing with... you never know he's not going to share. He may notice you playing with it similarly or differently. On top of that, he's going to notice similar characteristics between the two objects. Orion will push people away with his hands. We think there are two different purposes for this action, depending on the context. First, he may need some space. Observe and wait until either he comes to you or after a while you can try again to make contact. Sometimes Orion would take a quick sweep of the area with his hands to see if you're actually still around and goes back to playing. The second and most recent realization is that he's pushing you (or if he's sitting in a chair, dragging you behind him) to go get something or more of something (that we have to try and figure out 'checklist' style). 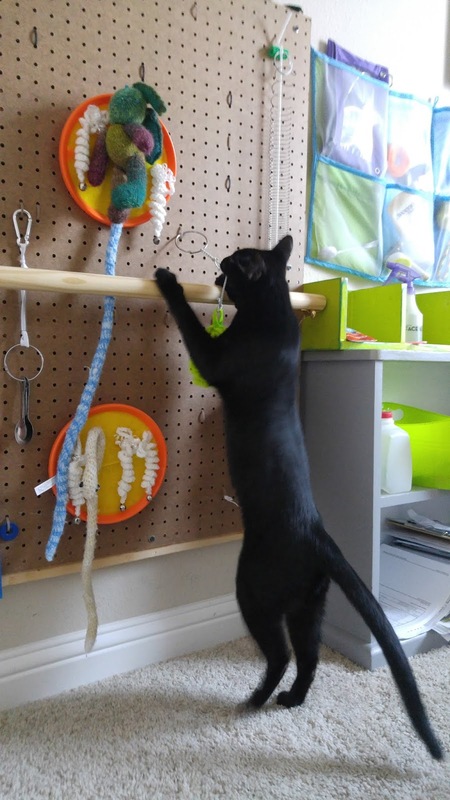 Now, for the times that no one is available to interact with Orion, we hope he would enjoy playing with toys/playthings independently. The cool thing about not always "entertaining" Orion ourselves is that when Orion can settle down and play by himself, he's playing at his own pace, giving himself time to process what he thinks and tactually feels at his developmental and emotional level, he can actively play without us helicoptering over him. As Orion is developing, learning and figuring out new skills and actually manipulating playthings- he's learning to play at his own will, what his hands discover and the changes he is able to cause. Real is preferred over "junk" playthings. Real objects are self-explanatory, expandable and great for scaffolding concept development, building ideas on top of existing observations and knowledge. The rate of information input through our skin is slower than would be through distance senses of sight and sound. We want to make sure that time is spent on quality, rather than junk- things that are fake, plasticky, miniature, thus confusing and misleading. I learned the term "sensory diet" from a discussion by David Brown (who didn't take credit for that term), with the focus on input for sensory needs, a.k.a sensory nutrition (not about toys) in a Perkins School for the Blind webcast on CHARGE Syndrome: Sensory Processing. Brown also discusses the vestibular and proprioceptive senses in this webcast. Extra: Read more about "Sensory Diet" and activities directly benefitting sensory needs. Many thanks to the late Dr. Lilli Nielsen for the attention on playing (a.k.a. learning!) There's a new collaborative website on this topic: http://www.activelearningspace.org. I highly recommend this website and going to Active Learning workshops near you. 2-year-old Orion in an Active Learning "little room" loaned from TSBVI Outreach. Think about it this way: If a toy is designed for and enjoyed by a DeafBlind child then it will be accessible and potentially enjoyable for all children. 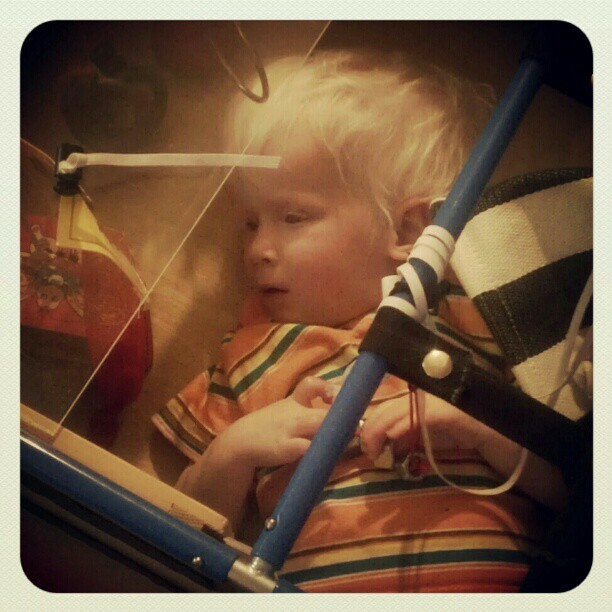 (Many toys may be fun for children younger than the DeafBlind child's current age.) 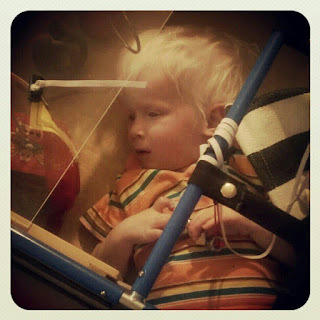 If a toy is designed for sighted/hearing children it's likely it will not be a DeafBlind-friendly toy. However, when there's a will to play, there's ways items may be repurposed for fun! There were no Toys'R'Us monolith stores in the 19th Century! Imagine what children did for play back then. I think it's safe to assume everyone had fun playthings to spend time with and they turned out all right. yoga ball (There is a type of yoga ball with a weighted sack inside it so it doesn't roll away). Did you notice that you wouldn't have to go to a toy store for the items in the list above? For Orion, simpler is better, less confusing and frustrating, more fun and easier to manipulate. 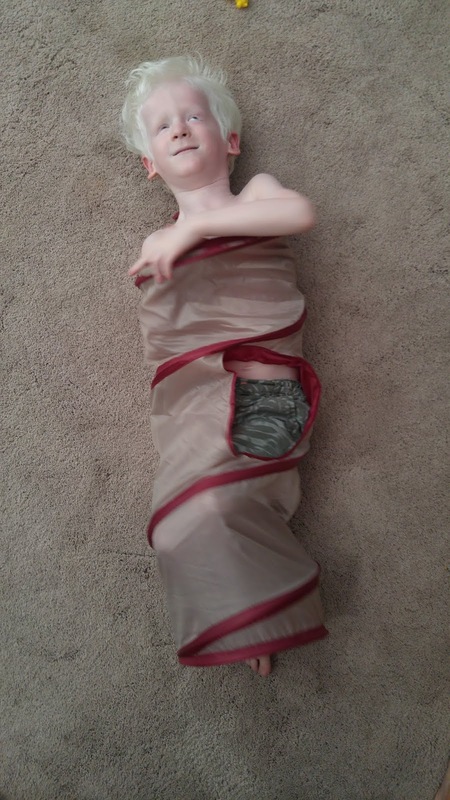 Orion put himself in this narrow and crinkly kitty tunnel at his grandparents' home. Photo by Heather Withrow, August 2016. He loves dumping the box of youth size 1 shoes (his current shoe size at 8 years old) near his playroom doorway and deliberately picking a matching pair of shoes to hold in each hand. Note: He will take any size shoes, whether there's still feet in it or not. He played in the cat tunnel more than his grandparents' cats ever did. 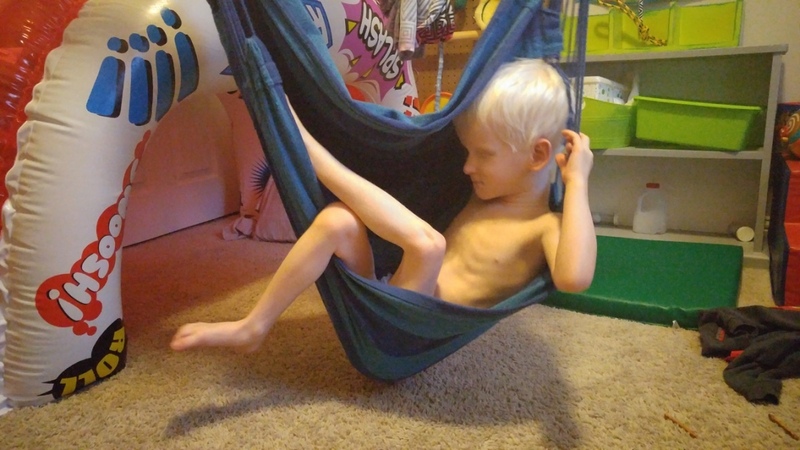 He enjoys the sky hammock chair his grandparents gave him for his 6th birthday. He enjoys the catch scratch arch as much as our own cats but in his own way. A length of lycra knotted together at the ends make a great stretchy swing/body sock. Orion works to find the right lounging position in the hammock swing. Photo by Heather Withrow, January 2017. When Orion was a baby through to around 2 years old, he enjoyed time in his infant play gym that was placed within the safe walls of an empty, round inflatable kiddie pool. Tactually interesting objects were hung from the play gym. Toys were kept from rolling away out of reach by the swimming pool walls. 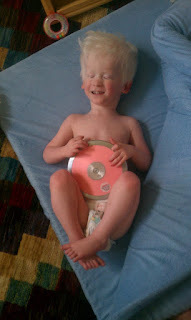 When Orion was a toddler and by that time he had better midline head control, I remember him sitting up and accepting leaning somewhat forward on a large plastic musical ball-popping toy and staying there without throwing himself backward in protest. When we moved to Austin, Texas when Orion was two years old, he was comfortable enough to scoot his way out of the dry kiddie pool. The pool was also a safe place for Orion to practice sitting up as he'd land on the inflated sides or on the pillows, lush sheepskin and memory foam mat within the pool. Easier to bubble-wrap his environment than the kid himself! Even with all that protection, we were hovering over him ready to save him until one day nobody was there to stop him from falling backwards from his seated position. The blessing went way beyond the fact he was not hurt, to him realizing he needed a safer way to get down from his floor-sitting position. And soon he did figure that out. Activity board in Orion's play room: Orion is not motivated to play with the objects on this. It would work better if I had added more items of interest on it. One of our cats, Sharpie, likes it. A bit too much. Photo by Heather Withrow, October 2016. Orion does manipulate these things occasionally. I would give these toys away but seeing Orion occasionally playing with them tells me to keep them for "rainy days" or put-aside-but-still-discoverable-at-ground-level. There's always a chance he may use a manipulation skill later on and really play with these toys as they were designed for. Many of these toys he is just content to dump them out of the box they're in at least once a day. He's been doing them for years! For example, on Monday after school he would scoot on his back by these boxes where they sit on the shelves, dumping them as soon as he's able to touch them. Later that night, I'd clean it up and then on Tuesday he does the same thing all over again and so on. At least he KNOWS where the stuff came from, the next thing is to PUT them back which is important for concept development and Mom's sanity. Orion touches the sequins on Happy the Hedgehog. Photo by Heather Withrow, December 2018. The blurry-looking toy Orion is holding is a Dimpl Duo. Photo by Heather Withrow, December 30, 2018. He would play with toys in the way it was designed for, or in unconventional new Orion-innovative ways. Books (braille, tactile, or sighted-only empty books) He would feel the books... then start to rip it apart! Even the board books! Orion may briefly touch an object given to him and put it aside. *Blink-blink* goes Mom and Dad's eyes. "I don't think he felt that one right." We try giving it to him again. The kid touches-it-then-puts-it-down. Mom and Dad try again. The kid touches-then-tosses-that-annoying-thing-in-the-opposite-direction! There may be several factors why Orion or your kid would not want to play with something. He may just prefer to interact with you. It may be an internal issue (sick, congested, hungry, tired, wet) or an external issue (cold/hot out, too many people, overwhelmed and not given enough time to process their experiences.). The toy may be too abstract, complicated, or baffling. In any of these cases, I would reserve these toys for a day in the future when Orion would be ready to try again, explore the object at their own pace and in their own way. Also, the toy may be in a material that your child doesn't enjoy. I'm a huge fan of the "Likes and Dislikes" form on Washington Sensory Disabilities Services's website that keeps track of sensory characteristics to look for and to avoid. A .pdf of the blank list is available here. You can always return to your child's list to find sources of motivation for your child. Stuffed toy animals (except for Happy Hedgehog!) They're so cute but he wants to be cuddling in their faux fur instead. Our pet cats. Thankfully, Orion does not want to wear their fur. Our white German Shepherd puppy, Aiko, is persistent, still learning to be careful and I think she will eventually win Orion's heart. Orion can be particular about some textures' "sub-categories". He would enjoy a plush blanket; however, if it were a stuffed animal, then no. He would enjoy stickers and large sticky sheets; but he hates sticky food that gets all over. Some things on this list of cool stuff I want to try with him may be a hit or a miss. Orion has an Amazon.com Wish List that I occasionally update with toys I want to try with him. 80' zip line kit and add a HOPSAdress or chest harness to it. Call it an outdoors ceiling track so he could "wander safely in the backyard"? I know the zip-line will sag and be low in the center. Should be interesting to see what Orion does. Large, powerful industrial fan (rigged to be safe for Orion's prying fingers), something to "blow" him away. A personal wind tunnel? 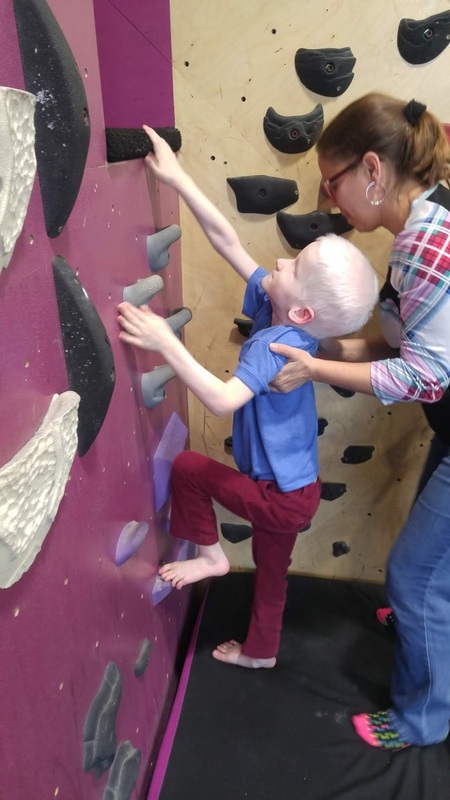 Orion, with his intervener Nanette, considers his options for reaching a platform in the wall. Crux Climbing Center, Austin, TX. The upside of these "misses" is that Orion's siblings and other children would enjoy them anyway. Pretty awesome ideas, though, right?! Family Connect: http://www.familyconnect.org/info/after-the-diagnosis/helpful-products/gift-ideas-for-parents-of-children-who-are-blind-or-visually-impaired/125?platform=hootsuite The stuff here can be fascinating for any child. I ordered something for Orion's big brother from this list. (I found their catalog categories of "Sensory" and "Physical" more meaningful for ideas for Orion. Orion (around 1 1/2 year old in this photo) explored toys attached to a little apron. Objects include a wiffle ball, a wood clacker, jingle bell, hairbrush, cross-stitching mesh. The idea was inspired by "Hold On", by Ohio DeafBlind Project. 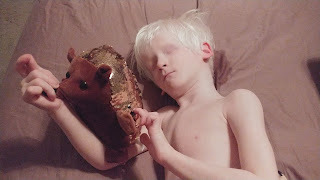 Ohio DeafBlind Project's online slide presentation of make-at-home toys for blind/visually impaired children with or without multiple disabilities: "Hold On" (https://www.slideshare.net/teechkidz/hold-on-by-ohio-center-for-deafblind) When Orion was around one and a half year old, I made for him something similar to the play smock seen on slide 9. If you know a resource available via Internet link that you do not see here, please let me know, I'll be happy to add them. OK, I've organized the toys, right? I've attached my thoughts, learnings and observations to this post about Orion's playthings experiences so now we're all set. Right? Orion could come around and contradict everything I've discussed here! Your DeafBlind child is very likely to have different likes and dislikes from Orion's, too. If you're a family member thinking about gifts, consider likes/dislikes, developmental level being appropriate for enjoyment, accessibility, pretty much everything I discussed already. Playing independently is great but that's just part of the big picture. Our kids need respectful, responsible and fun human interactions to continue to develop, learn and be motivated about what's at and beyond their fingertips. Let this be food for thought. A complicated, elaborate and worthwhile scheme over making sure someone is listening and constructively responsive and something is accessible and enjoyable for DeafBlind children as they're kids, too! Orion (8) independently expanded this transforming sphere to it's 30-inch maximum width. Orion's big brother spotted him doing this when I was typing this blog post. He must've found it on the bed and... voila! He has experienced the mini sphere many times before so likely he had pretty good ideas how to expand a bigger one. A perfect Christmas gift from Uncle Jk. Thank you! Orion (looks like he is 4 years old in this picture) with two of his favorite people: his big brother and sister. 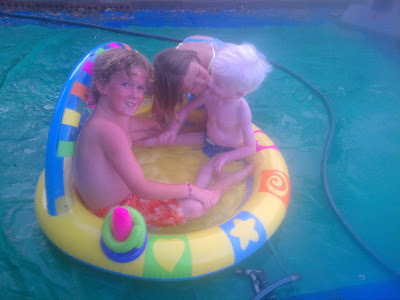 The three of them are in and about a very small inflatable kiddie pool, His sister is giving him a kiss on his cheek. This e-mail was composed and sent to our Texas State Board of Education representative for District 5, Mr. Ken Mercer, on September 26, 2018. I am writing to you concerned about the State Board of Education’s recommendation to eliminate Helen Keller from Texas’ 3rd grade textbooks and curriculum. I’m a Deaf mother of three children with different hearing/deafness etiologies. My oldest son is Deaf and in 8th grade, my daughter is hearing and in 7th grade, and my youngest son, Orion, who is DeafBlind is in 3rd grade. I am currently studying for my M.Ed. in Special Education focusing on orientation & mobility via Texas Tech University. Meanwhile, I will be receiving my academic certificate in DeafBlindness in December 2018. I understand a rubric was used to evaluate historical figures, with the goal that decisions can be as objective as possible. However, with this rubric, Helen Keller was given 7 points and recommended for removal, yet Billy Graham a pass to be kept in the curriculum regardless of a rubric scoring that was lower than others slated for removal. The rubric configuration that was used is clearly not working and is inconsistent, thus not credible in my eyes. Helen Keller caused change and enlightenment to take place worldwide. Taking 40 minutes of instructional time to talk about Helen Keller is not only the tip of the iceberg, it opens a door to further development understanding, empathy and many friendships with people who are different. Approximately one out of five Americans have a disability. Our curriculum needs to reflect that. We need to retain exemplary role models who have disabilities for children with or without disabilities. Although Helen Keller was not the first DeafBlind student in the U.S., she was the first DeafBlind graduate of Radcliffe College. She co-founded what is now known as Helen Keller International, an organization that brings awareness and prevention of blindness worldwide. Helen Keller met several US presidents, she challenged the Lion’s Club to aid the blind and visually impaired which they proudly still do to this day, she worked for the American Foundation for the Blind until her death in 1968. Her body [lies] in rest at the Washington National Cathedral. Keller was so famous that anywhere she went, people paid attention to her and what she had to say, making a positive difference. Helen Keller was not only an extraordinary DeafBlind person, she was a notable, exceptional person regardless of her abilities. The Helen Keller National Center for Deaf-Blind Youths and Adults (HKNC) was established in 1967 after the Helen Keller National Center Act was passed to provide rehabilitation training for individuals who are DeafBlind. In 1964, Helen Keller received the Presidential Medal of Freedom from President Lyndon Baines Johnson, our US president who hailed from Texas. Initially people are impressed by Helen Keller’s story as a person who is DeafBlind. Eventually, people will see quite a resume of accomplishments by anyone regardless of ability. I will be satisfied when the Texas State Board of Education withdraws their recommendation for removing Helen Keller from the curriculum. I thank you and the State Board of Education for your time spent on considering this very important, far-reaching matter on hand. Orion always seemed to have a little more patience for little hands, even as a toddler in center-based early intervention programs (Kendall School's Parent-Infant Program & Texas School for the Deaf's Toddler Learning Center). He spent more time allowing and thinking about the hands of his similarly-sized peers. People who know Orion have recognized that there is something special about little hands for him! I had a conversation with Eddie Madera at the National Family Association for Deaf-Blind (NFADB) conference that was hosted in July 2016 in Austin, Texas. He brought up hand sizes, how similarly sized hands were easier for him to feel/receive. That made sense... Orion liked little hands perhaps because he could recognize the other hand's dimensions quickly due to it's similar small size. Enjoy this video of Orion's big brother and I talking about similarly-sized hands! Skyler's clip was from July 2016 and my part was from early 2018. God knows how long this has been sitting unpublished in Blogger! Let this video fly free! This is of our precious Orion during his first year at Texas School for the Deaf, at 2 years old in what was then called the Parent-Infant Program (now called Toddler Learning Center). It is a delight to present to you this collection of moment snippets of Orion and Amy, his teacher, during the 2012-2013 school year at TSD. This video was created in May 2013. The video opens with two women working on swinging Orion in his blanket. The woman on the left is Carolina, she is a certified orientation and mobility specialist (COMS), a key person on my son's IEP team. Amy, his teacher of students who are Deaf/HH, is on the right. If your child is DeafBlind, blind or visually impaired, he has the right to have an orientation and mobility (O&M) evaluation and if a need is found, to then receive services. Orientation and mobility is listed as a related service under Individuals with Disabilities Education Act (IDEA, 2004). No baby is too young for O&M services. Like you saw in the video, Orion received O&M at 2 years old. Movement development starts at birth! At 3:27, in the shot where Orion is sitting at a floor table, he is surrounded by his early intervention team which included a speech-language pathologist (Tracy, in the video), occupational therapist and of course an ASL interpreter so the team and parents could communicate with each other. It's been a while since I last blogged! I've been so busy juggling family and graduate school, that I've been sitting on this video, a vlog, a video log, that I created in August. I finally captioned it! So since in my eyes, it is now accessible, I will share it. It's about touch information for Orion, how we get certain information to Orion over a small distance or directly in touch. This video was created as a spin-off of a blog post on the same topic that I published earlier this year, "Pearls of Touch". I've included two video clip examples of sharing tactile information with Orion. It's 14 minutes, closed captioned (click on the "cc" icon if you need it), and enjoy. Public comment submitted to the U.S. Department of Education on August 10, 2017, to www.regulations.gov on ED-2017-OS-0074, comment period deadline is August 21, 2017. "The U.S. Department of Education is inviting comments regarding their regulations. The June 22, 2017 Federal Register contains a request for comments, In accordance with Executive Order 13777, ‘‘Enforcing the Regulatory Reform Agenda", signed by President Trump February 24, 2017. The Department of Education is now seeking input on regulations that "may be appropriate for repeal, replacement, or modification." This is our opportunity to send in comments to modify the Related Services regulation by adding Intervener Services to that list (“CFR Title 34, Subtitle III, Chapter III, Part 300, Subpart A, §300.34 Related Service)." Source: personal email. I request a modification of the regulations to include Intervener Services on the list of Related Services. Trained interveners are difference-makers for DeafBlind children no matter what the children's ages are or skills and language they have. They are able to adapt to work WITH the child and not FOR the child, they seek out opportunities for the child to access and make connections with things, people and the environment, they are responsible for the child's social and emotional development. Yes, education of DeafBlind children is a very young field. Even with early DeafBlind people, Laura Bridgman (b. 1829) and Helen Keller (b. 1880) (www.perkins.org), it is still new compared to public education and Deaf Education. In the short time this field has grown, knowledge and skills, for which there are currently Council for Exceptional Children standards (CEC link below), in interveners have proven time and time again it is a best practice in the education of DeafBlind children. My 7 year-old DeafBlind son, Orion, is one of these students fortunate to have been assigned interveners over the years, his first one was when he was 3 years old. It was at that school and the first time for Orion, the IEP team voluntarily listed intervener services, which he received 1875 minutes of per week, under Related Services in his IEP document. With the support of personnel skilled and experienced with DeafBlind children, including interveners, Orion is walking more, drinking via straw, making choices when offered, making progress with requesting things or actions of other people. Most important of all, Orion is happier on these school days where he can understand what's happening and has been "heard" by competent people who understand him. Unfortunately this is not true for all DeafBlind children during the critical early years of their life. Caregivers, one-on-one aides, nurses, volunteers who are not trained or experienced in this field do not reach the level of efficiency in schools that interveners bring. The good news is that there are training resources available, some are online resources and online training programs through a few universities. One of them is a 27-module online resource developed by the National Center on DeafBlindness, funded by the Office of Special Education Programs called Open Hands, Open Access Intervener Modules (OHOA). There is national intervener certification available through NICE (National Intervener Certification E-Portfolio) that is based on the CEC intervener skills and knowledge standards. By modifying the Related Services list to include Intervener Services, it opens the door to educate, empower and enable our early intervention, K-12 professionals and particularly DeafBlind children to successfully access education currently offered to all the children in our country. Open Hands, Open Access Intervener Modules. National Center on DeafBlindness. http://moodle.nationaldb.org. Retrieved online August 2017. Specialty Set: Special Education Paraeducator Intervener for Individuals With Deafblindness (PDBI). Council for Exceptional Children. 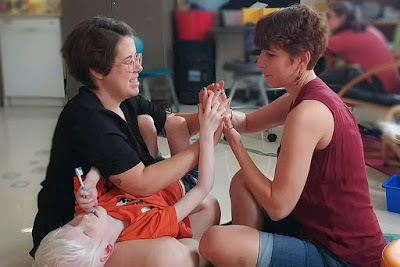 https://cec.sped.org/~/media/Files/Standards/Paraeducator%20Sets/Specialty%20Set%20%20%20Special%20Education%20Paraeducator%20Intervener%20for%20Individuals%20With%20Deafblindness%20PDBI.pdf. Retrieved online August 2017. What is NICE? National Center on DeafBlindness. https://nationaldb.org/pages/show/national-intervener-certification-e-portfolio-nice/what-is-nice. Retrieved online August 2017.